The Pope – the serious side of Easter! A new celebrity has been chosen to represent one of the most enduring, historical institutions: The Catholic Church (1.2 billion worldwide). 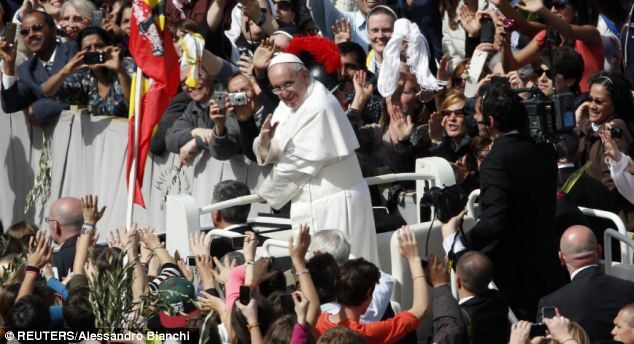 Pope Frances is the 266th Pope and has begun the traditional religious Easter Celebrations at the Vatican City. Many Catholics will attend Church for special ceremonies and also watch the Pope this weekend on TV or the Internet. The Easter Bunny – the fun side of Easter! 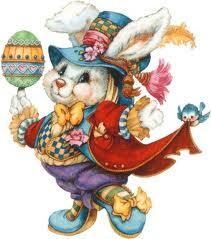 Easter creates a holiday time from work for most people or a 3-4 day weekend (Friday to Monday: March 29 - 31). During Easter most families with kids will have an Easter Egg Hunt. 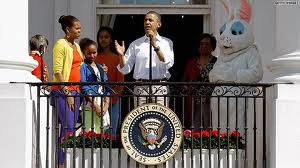 The idea is that the Easter Bunny will arrive at night and hide Easter eggs or candies for the children to find on Easter morning. Of course the parents are the Easter Bunnies. An egg hunt is a game during which decorated eggs, real hard-boiled ones or artificial ones filled with, or made of chocolate candies, of various sizes, are hidden for children to find, both indoors and outdoors. When the hunt is over, prizes may be given for the largest number of eggs collected, or for the largest or the smallest egg. And of course, in the case of chocolate or other candies, the children get to eat what they have found. If you are interested in seeing an easy and common way to create Easter Eggs with children, but not the chocolate kind, then check out this video! Listen to the video once or twice and then on the third time try to fill in the blanks [Hint: I have removed common words and expressions for explaining how to do something.]. Hi, I'm Kathy Moore for About.com Parenting. Coloring Easter eggs is a great family tradition to start with your children. This program will show the kid friendly steps for basic Easter egg coloring. ______________ either covering the table with newspapers or a vinyl tablecloth. I find it is also a good idea to boil the eggs and allow them to cool before I invite the kids to help. __________, just like any cooking activity, ____________ your kids wash their hands before they begin. I also have my kids wear their cooking aprons to protect their clothes. ______________ on the coloring kit, or any simple dye recipe. I use 1/2 cup of water with 1 tablespoon of vinegar and enough food coloring to get the shade I want. ________ the kids stir the bowls to make the colors. ________ for your child ___________ place the hard boiled egg on a soup spoon and gently lower the egg into the color. The longer the eggs are left in the dye, the darker the color will be. Once the desired color is set, scoop the egg out of the color and pat it dry with a paper towel and let it dry on an egg holder. ________ toilet paper roll cores work well for this if you did not buy a coloring kit. ______ they get good at one color, _____________ dipping one end of an egg in one color, and the other end into another color. This ________ their fingers a bit messy, ______ it is a fun result for the kids. Using washable tempura paints in squeeze brushes is ________________ eggs. This ______ is great for younger kids who are not always keen to sit and wait for eggs to sit in the dye. ________________ decorating ideas that kids can try such as coloring the eggs with a crayon before dipping them into the dye, or putting stickers or other decorations on the colored egg. Easter is a great time to engage in family activities. Decorating Easter eggs is ________ a creative outlet, ________ an activity that will build your child's fine motor skills and maybe even start a tradition that will last a lifetime. I would also suggest either covering the table with newspapers or a vinyl tablecloth. I find it is also a good idea to boil the eggs and allow them to cool before I invite the kids to help. Then, just like any cooking activity, make sure your kids wash their hands before they begin. I also have my kids wear their cooking aprons to protect their clothes. Follow the directions on the coloring kit, or any simple dye recipe. I use 1/2 cup of water with 1 tablespoon of vinegar and enough food coloring to get the shade I want. Let the kids stir the bowls to make the colors. Demonstrate for your child how to place the hard boiled egg on a soup spoon and gently lower the egg into the color. The longer the eggs are left in the dye, the darker the color will be. Once the desired color is set, scoop the egg out of the color and pat it dry with a paper towel and let it dry on an egg holder. Cut up toilet paper roll cores work well for this if you did not buy a coloring kit. Once they get good at one color, let them try dipping one end of an egg in one color, and the other end into another color. This may get their fingers a bit messy, but it is a fun result for the kids. Using washable tempera paints in squeeze brushes is another quick and easy way to decorate eggs. This method is great for younger kids who are not always keen to sit and wait for eggs to sit in the dye. There are also lots of other decorating ideas that kids can try such as coloring the eggs with a crayon before dipping them into the dye, or putting stickers or other decorations on the colored egg. Easter is a great time to engage in family activities. Decorating Easter eggs is not only a creative outlet, but also an activity that will build your child's fine motor skills and maybe even start a tradition that will last a lifetime. Always happy to meet new people! See you next week! In Russia the celebration of Easter is a bit different and it was interesting to read how this great holiday is celebrated in other countries. For me it's a pity that we don't have Easter Bunnies and The Easter egg hunt - it would be fun! Thanks for your comments! What are some of the highlights of Easter Celebrations in Russia?